They finally went and did it. Granted, the signs have long been there – not least in human form as Liam Byrne – but this week the Labour leadership finally capitulated to the Tory agenda on benefits once and for all. This is what Ed Miliband said today: ‘The biggest item of expenditure, alongside the NHS, is the social security budget. The next Labour government will have less money to spend… Social security spending, vital as it is, cannot be exempt from that discipline.’ He came out in favour of a three-year cap on welfare spending. As ever with an Ed Miliband speech, there is plenty of vague leftish waffle in there to sugar the pill – this time talking about housebuilding and tackling private landlords. But that should not distract us from the core of the message, full of disgusting phrases like ‘something for nothing’, ‘there is a minority who don’t work but should’ and ‘it is wrong to be idle on benefits when you can work’. The more you read, the worse it gets. Miliband thinks that people should get lower unemployment benefits unless they have worked for at least five years. He proposes that parents should be forced (‘we should offer and demand’) into work-related training when their children are as young as 3. He supports Atos-style tests for disability benefit in principle. He says the retirement age should increase – again! 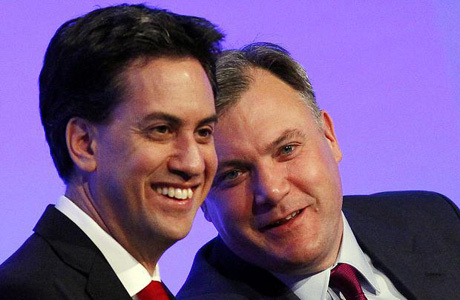 All that comes after Ed Balls’ prelude earlier in the week. His plan to slash winter fuel payments was widely reported as only hitting ‘wealthy pensioners’. But this is to misunderstand the point of the principle of universal benefits. As soon as you limit benefits to people on lower incomes, you introduce the nightmare of means-testing, where people have to fill in long forms and prove they’re poor to get the benefit. People feel stigmatised, and afraid that any error will carry a harsh punishment. The end result is that many leave money they are entitled to unclaimed. Balls spoke of ‘iron discipline’ on spending – and said he would stick to the Tories’ spending plans after the election. In one deft move, then, Labour has not only given in over welfare but sold the pass on all public spending cuts for years to come. But is it any wonder that support for welfare is slipping when the main social democratic party refuses to argue for it? Is it a surprise that people don’t ‘get’ universalism when there’s no voice putting it forward? Are we really supposed to believe that people are so easily led that the right wing press’ myth-making can make them magically forget the entire banking crisis? If Labour won’t speak up for the welfare state at the very moment when its existence is imperilled, then it’s up to us on the left to make sure we defend it more strongly than ever.